would like an invite ign TACOxBOY. I too would like an invite, ingame name is ZiggySpringste. 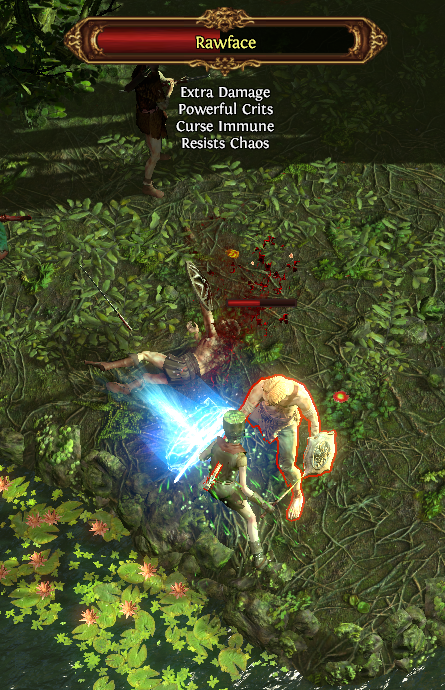 Never really got into one of these diablo type games, think the closest I’ve got is Phantasy Star online on the Gamecube, but so far I’m enjoying clubbing zombies over the head with a massive twig. Hello, would also like an invite. I played in the beta, but stopped when my friends did, but now started again when they released it. I’ve just created a guild for RPS members on Path of Exile, now that it’s been officially released. I intend this to be a safe haven from the horrors of global/trade chat, a place where people can learn the game together, find groups, trade fairly, and just chat away! I’m “Faldrath” over there as well, so if you want an invite, just let me know! Hey Faldrath. I’ve sent you a friend request in PoE. Can you add me to the guild please? Having turned off Global and Trade chat about 5 minutes after getting back into the game, it would be nice to have a chat channel available that isn’t entirely unbearable. Thanks for inviting me to the Guild, I ended up beating the game once. I will come back and keep playing… really enjoyed it. I didn’t get to play with Guild members at all, but I did play often with other randoms. All of you have invites! I am enjoying path of exile but sometimes ahve trouble finding the gems I want ingame. So I thoughtn why not start an exchange thread on RPS ? Heh… i ran into that arrow scaling bug a couple of times in the past and it’s always worth a chuckle - especially if it happens to an arrow that you got hit with. or even better: one of your zombies… watching them waddle around with such a monstrosity attached to their head is comedy gold - i hope they never fix it. Pssst… Faldrath, could you send me an invite to the guild when you get a chance? I don’t seem to have gotten one. Cheers! Cheers for the invite Faldrath! I’m fairly low level right now. Just wondering what you guys would like contributed to the guild stash. I dropped in a nice rare bow and quiver if someone is starting out with a ranger anytime soon. I threw a few bob into the guild cash so we can buy another tab for the guild stash. I had some money from when I went in on PoE as an early backer or whatever. I’d love an invite, although only recently started playing so and not sure I’d be much of an asset to the guild. Love the game, but it has been a lonely experience so far. My character name is Furyboy, and I’m a lvl 8 marauder. Thanks! I’m pretty early on too Furyboy, so if you see me online I’ll gladly join a game. Can I get an invite for my lvl 27 Marauder - Mad_Dave? Other than Torchlight 1 I’ve not played much in the way of ARPGs, this one has it’s hooks into me. Invite sent. By the way, I’m not sure if guild chat is turned on by default, so all you new people should check that if you haven’t!